Trichologist - Hair loss cure: Supplements, Shampoo, Hair transplant? Searching the Internet for answers concerning any medical condition can be at best daunting and at worst mentally debilitating. We all like to think of ourselves as amateur physicians and try to cure what ails us with information from the Internet. For those with hair or scalp issues, the search results and advice can be endless and moreover fraudulent. For those who are suffering from a mature hairline, thinning hair, hair breakage and other hair/scalp conditions, you’ve more than likely been introduced to the words Trichology or Trichologist during your search. What is a Trichologist and how can they help with hair loss? A Trichologist is not a Medical Doctor, and is more akin to a Cosmetologist, and other related professions. They do have a specific understanding of hair and scalp issues and can advise you on specific treatments for these problems. As many people are a bit hesitant to see a doctor about such issues, a Trichologist is a suitable alternative to advise you on a course of action and even to recommend a certified dermatologist. As your hair and scalp are good indicators of your overall health, a Tricologist will provide a thorough examination of these areas and discuss with you many aspects of your life. Lifestyle is a large part of your overall health which a Trichologist will investigate and provide specific recommendations to solve your problems. They will also advise you if you have no underlying problems but just want to keep your hair and scalp looking healthy and vibrant. Because of the subject matter, especially with females, a Trichologist can be more than just a clinician offering specific solutions. We are familiar with the good-natured ridicule that goes along with Male Pattern Baldness, but with women it’s a vastly different situation. Woman don’t go around kidding each other about hair loss as men do, and its probably one of the most sensitive health subjects for women. For women a Trichologist can do many things with regards to the scalp, quality of hair and suggestions for improving one’s overall look. Oils, lotions, foods, overall diet, etc., are a big part of what a Tricologist can do. Unfortunately, there are limits to these natural supplements and chemical remedies, as well as a point where Trichology is no longer helpful and a Medical Doctor is necessary. 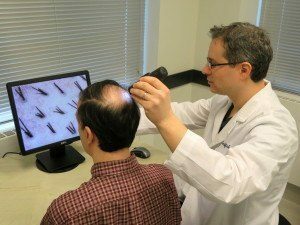 At what point should I see a Medical Doctor about Hair Loss? Other than Rogaine and Minoxidil, there are no other methods for stopping hair loss or regrowing hair. You can only do so much with your diet and lifestyle to improve the density and growth of your hair. At this point it is incumbent upon you to seek other solutions, which in most cases is a Hair Transplant. This may sound like a drastic move, but you will just be one of the millions before you who have benefited on 21st century technology and medical knowhow. Hair Transplants have become the norm for many Hair Loss patients and the best and most affordable way to solve this problem. Its very effective and natural results have prompted patients of all kinds to have this treatment. On top of being almost undetectable, prices have become affordable in many countries. Even with the latest technology, the FUE Safe System, countries such as Hungary provide the procedures at a fraction of the price of other countries and with quality on par or better. For example, if you’re living in a major city in the UK and want to fly to Budapest for a Hair Transplant, the cost savings including, the flight, accommodations, transplant and all other ancillary costs can be around 65% of what you would pay in the UK. On top of this, you get to spend some time in Budapest, which is one of the fastest growing and most beautiful cities in Europe. It’s a permanent and natural solution which will be a huge boost to your ego as well as improving your overall well-being.